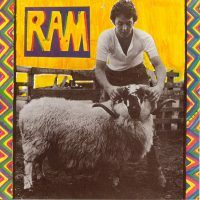 Paul and Linda McCartney's 1971 album Ram is to be reissued in the US on 22 May 2012, and elsewhere in the world on 21 May. Ram is the only album to have been jointly credited to the McCartneys. It will be the fourth release in the Paul McCartney Archive Collection. The centerpiece of the reissue campaign will be a four-CD/one-DVD deluxe edition which is packaged within a 112-page hardback book. Ram will also be released as a single CD, a two-CD special edition, double disc vinyl edition, single disc mono vinyl edition, and digital download. Ladies and gentlemen, this is an album from a long, long time ago, when the world was different. This is an album that is part of my history – it goes back to the wee hills of Scotland where it was formed. It's an album called RAM. It reminds me of my hippie days and the free attitude with which was created. I hope you're going to like it, because I do! It has also been announced that this year's Record Store Day, which takes place on Saturday 21 April, will see the reissue of the McCartneys' standalone single Another Day. The vinyl single, with Oh Woman Oh Why on the b-side, will be available only from New Jersey's Vintage Vinyl Records. You have this incorrectly assigned to March 22 instead of May 22 in the title (and on the daily calendar). Otherwise great work as always! This article was published on the date the reissue was announced. The album was actually re-released in May.